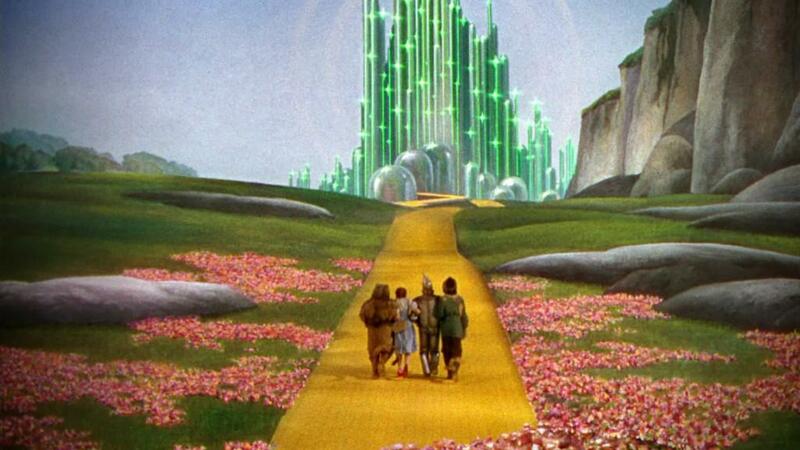 Excessive imbalances in the Bretton Woods system arrived every couple of years. Countries with negative trade balances and fiscal deficits often devalued their currency in order to gain competitiveness. 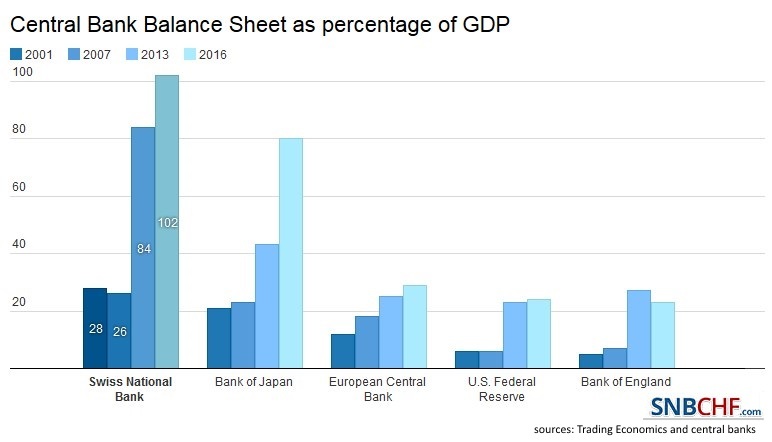 Some of them reduced debt by paying less interest on government bonds than the inflation rate, negative real rates, sometimes called “financial repression“. Examples are the UK and the U.S. that via financial repression and GDP growth managed to reduce the debt obtained in WWII. Switzerland represented a country with sound public finances, without financial repression , with a strongly positive trade balance. This resulted soon in a strong international investment position. 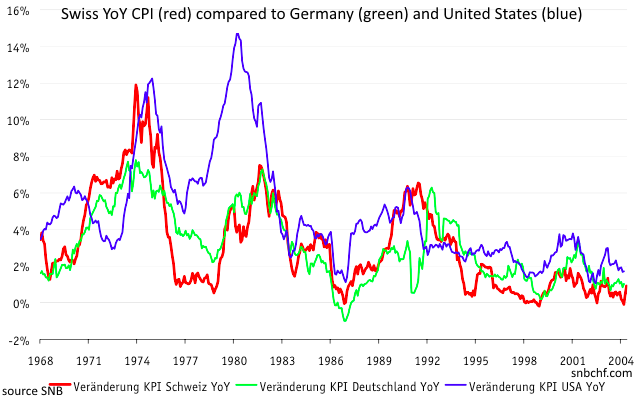 Thanks to its position as international creditor and the fear of suffering the inflationary history of neighboring Germany in the 1920s, the Swiss developed an aversion against inflation and financial repression. 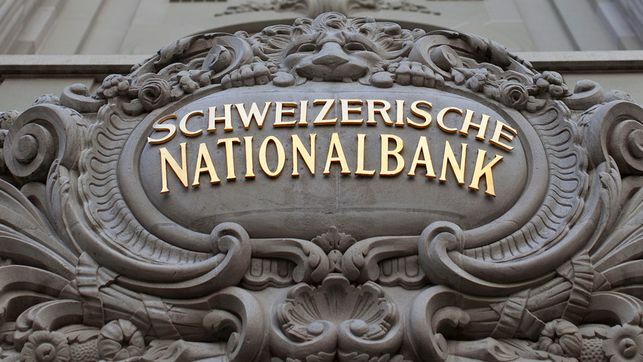 Together with Germany, the Swiss pioneered monetarist theories in the 1970s: The Swiss National Bank (SNB) allowed money supply to rise only gradually, using tools like minimum reserve requirements for banks and relatively high real interest rates. 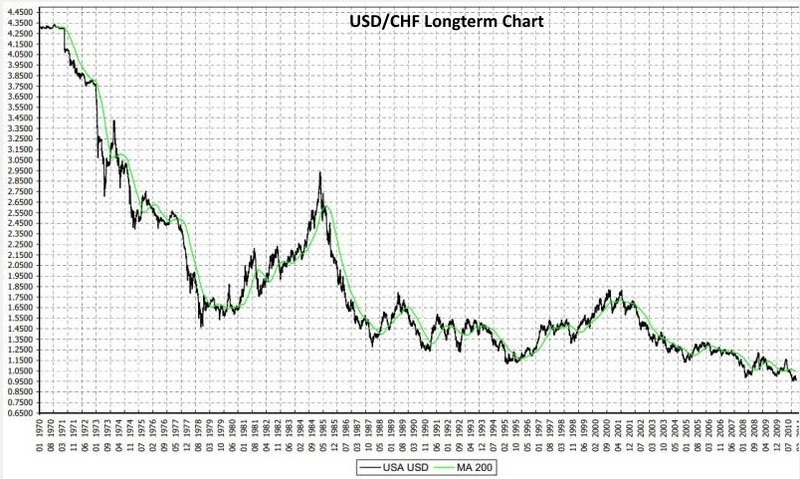 The diverting monetary policy between the U.S. and Switzerland resulted in a falling USD/CHF exchange rate since 1971. Thanks to small wage increases, lower inflation and smaller wage growth imply smaller cost increases for Swiss companies. This is reflected in low interest and borrowing rates and in the interest rate parity. 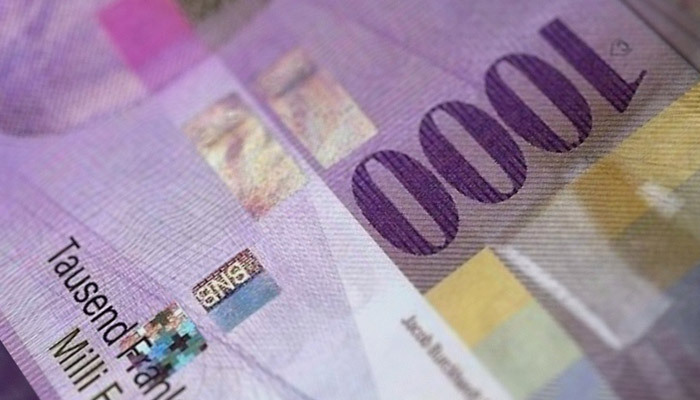 Small borrowing rates lower the cost of capital for Swiss firms. Immigration of (for Swiss levels) cheap personnel. High Swiss savings rates. Like anywhere, most savings are done in the local currency; with higher savings the local currency improves. Swiss diversify their wealth in different types of assets. Due to low interest rates and for tax reasons, mortgages are often not paid back quickly – “the bank still owns the house.” The well-diversified assets are far higher than this debt. 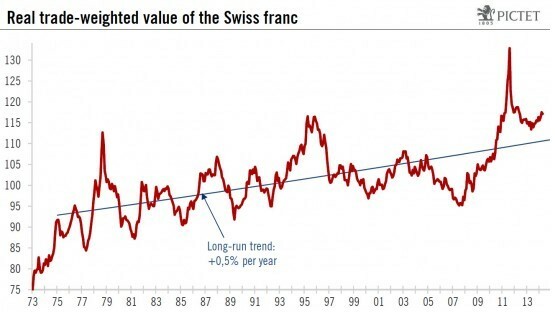 The ever appreciating currency is a “self fulfilling prophecy”: the Swiss tend to invest in local stocks in CHF or to hedge foreign currency exposure. Low Swiss taxes, efficient administration, low debt. Small Swiss distances and low spending on energy compared to the U.S.: Until the 1960s and in the 1980s oil was cheap and the United States could expand well. In the future, the U.S. may always have high (oil) trade deficits and therefore higher inflation. This results in positive Swiss real wage growth. In America you see the different movement: in particular due to rising prices of (imported) oil, real wage growth in the U.S. is often negative. But when oil prices go down – like recently in 2014 – then the dollar is king. Arabs or Russians that profit on rising oil prices often bring their wealth to Switzerland to safeguard it from their governments. This boosts the Swiss banking business and the whole economy. 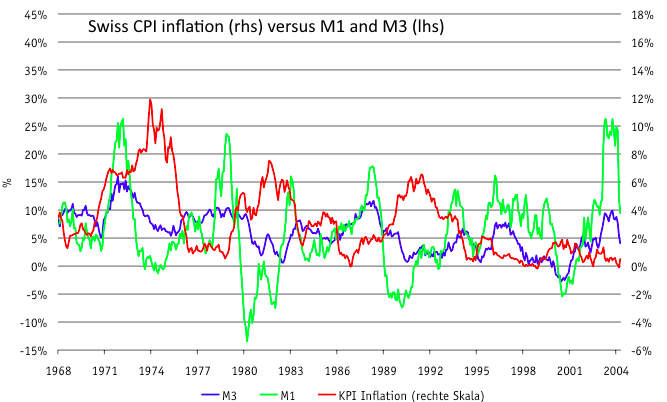 The graph shows that a period of inflation (red line) has regularly followed SNB monetary expansion, in response to the rise of the franc (green and blue lines). Despite the monetarist bias, a couple of times the SNB strongly increased money supply, often in response to an excessive rise of the franc. 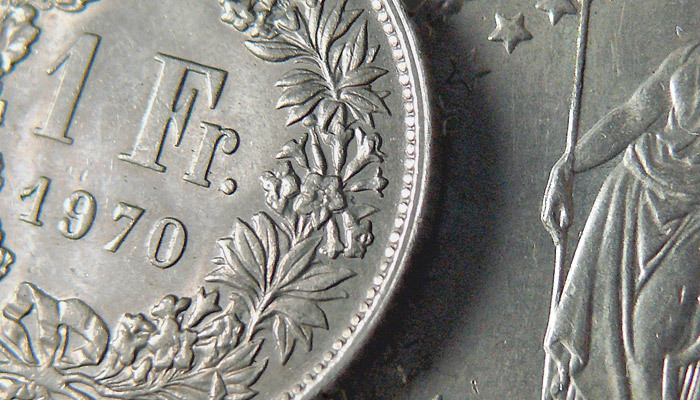 On the other side, the franc was always a volatile currency that appreciated in global crises and periods of high inflation – as safe-haven and/or inflation-hedge similarly to gold. 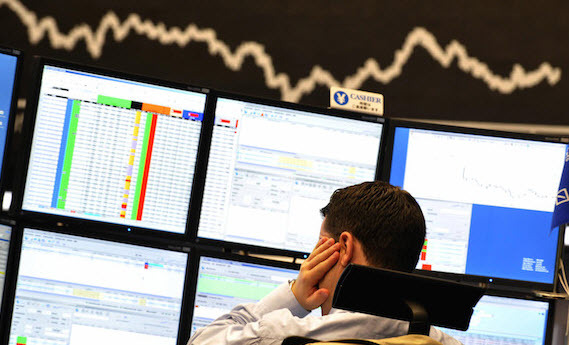 During periods of strong global economic expansions that did not translate into high inflation, the franc depreciated, examples are the early 1980s, the late 1990s or 2005-2008. 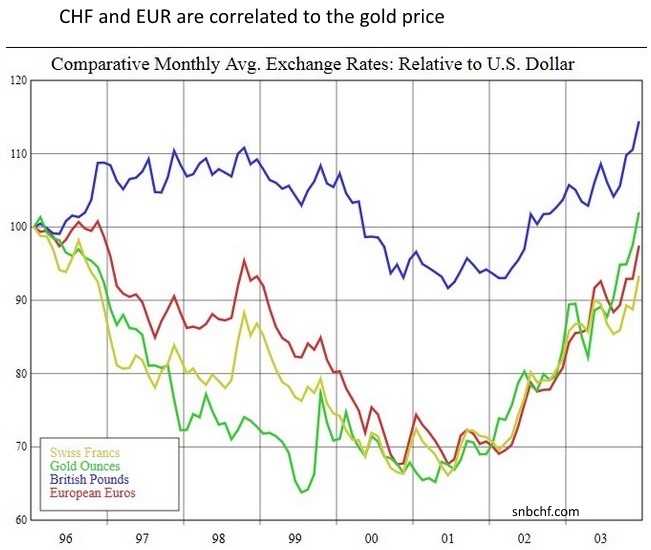 Hence the CHF was historically correlated to gold not only thanks to the big accumulation of gold reserves achieved from the strong Swiss trade surpluses. But also the slow wage increases and the inflation aversion of its central bank and its people contributed to this correlation. 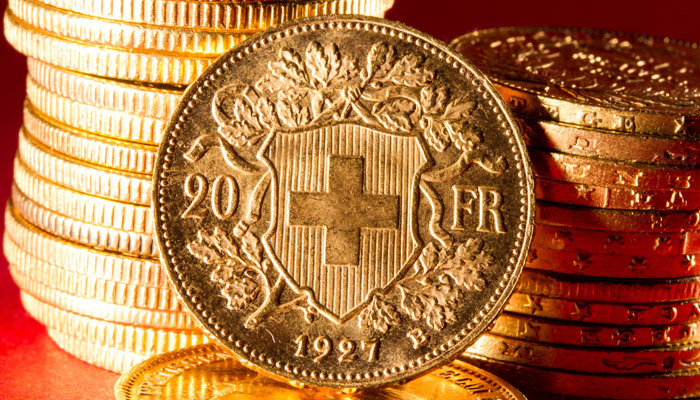 Until the late 1990s, the Swiss constitution even required that currency in circulation was (partially) backed by gold. 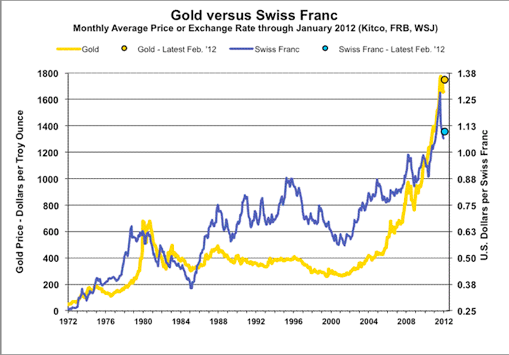 Consequently the franc often reached overvalued territory more or less at the same time when gold reached its highs.